It’s that time of the year again when we head to our gardens and terraces to enjoy the long summer days! Fermob continues to liven up our exteriors with its joyful and functional outdoor furniture, inspired by classic history of garden products. The French company, located just outside of Lyon, has over a dozen collections in various shapes and a multitude of colors that embody the French ‘joie de vivre’. Fermob’s pieces can be seen all around the world in such famous places as the Luxembourg Garden, Times Square or Google headquarters. 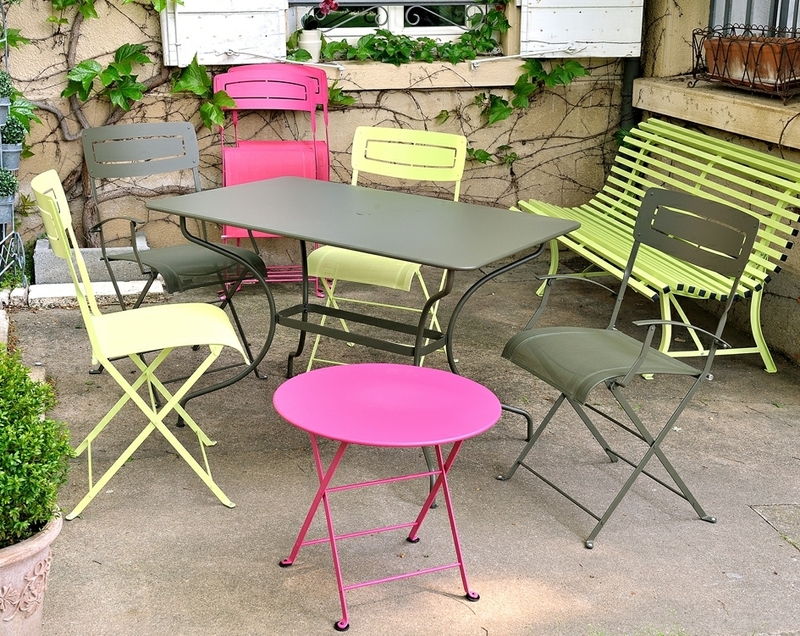 Several of the garden chairs and tables are foldable or stackable, which comes handy for storage and to keep extra pieces for large dinner parties. While Fermob furnishing is designed for use outdoors with an anti-corrosive finish, why not using a few pieces inside as well? The fun part is to pick up colors among the 23 eye-popping shades, and to mix and match them for a unique look. I personally have a thing for the vivid and fresh Verbena green! 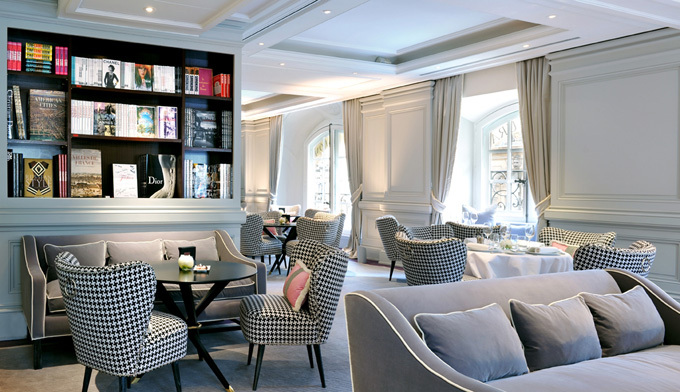 The stylish 1 Place Vendôme restaurant is located on the 1st floor of the Hôtel de Vendôme, a 29-room luxury boutique hotel at the heart of Paris. Italian architect Michele Bönan created an elegant couture-style interior décor, with a quietly refined ‘Dior grey’ setting, dominated by the black-and-white houndstooth armchairs motif. Perl gray velvet sofas and silver satin curtains provide an sophisticated backdrop, against which the pink silk cushions bring a touch of whimsy. While savoring a gourmet menu by chef Nicolas Rucheton, guests enjoy a magnificent view of the famous Place Vendôme and its jewellery window displays!